The IBM 737 was formally announced on October 1, 1954. 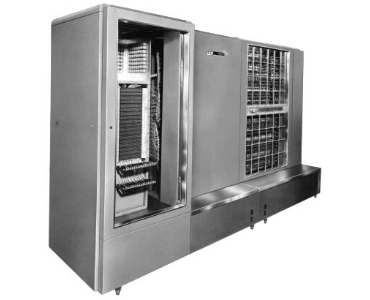 Users of the IBM 701 Data Processing System could specify the 737 in lieu of the IBM 706 Electrostatic Storage Unit to gain the advantage of magnetic core storage, viz., the elimination of regeneration time and the reduction of processing time in many applications. For example, the 737 reduced the time needed to perform additions, including access, from 60 microseconds to 36 microseconds. This faster processing speed was especially beneficial in problems involving large amounts of logic. The unit was available with one capacity of 4,096 36-bit words. When the 737 replaced the IBM 706, the system's 701 Electronic Analytical Control Unit had to be altered. Customers could rent a 737 for a fee of $6,100 a month. The IBM 737 Magnetic Core Storage Unit also could be used with the IBM 704 and IBM 709 Data Processing Systems.